It’s easy to fall in love with the flawless service of Cathay Pacific premium economy service. Our flight to Hong Kong from New York’s JFK promised to be the longest we had ever booked: 15 hours and 20 minutes from gate to gate, not including the time entailed getting to and from airports. I can’t tell you that it went quickly. That’s enough time (theoretically) to read a couple of books, watch a few full-length feature movies and catch some shuteye. Despite my anxiety over the length and distance of the flight, our time onboard Cathy Pacific premium economy was relatively comfortable and relaxed, so much better than what we had anticipated. We had checked into the costs of flying business class to Asia and the costs were prohibitive. Yet the thought of flying crunched up in economy seats seemed daunting. Premium economy seating seemed like a great compromise and our globetrotting son had flown Cathay Pacific premium economy several times, urging us to give it a try. Founded in 1946, this flag carrier of Hong Kong now flies to some 90 destinations in 30 countries, and operates five nonstop flights per day between New York City and Hong Kong. A founding member of the Oneworld Alliance, Cathay Pacific also has a subsidiary called Dragon Air that operates flights to other Asian-Pacific destinations. We flew on Flight CX841, a Boeing 777-300ER with four classes of service: first-class, business, premium economy and new economy. After we got over the “seat envy” of passing through the cabin with lie-flat business class seating, we settled into seats 33D and E in the premium economy section of the plane. With a pitch of 38” and width of 19.5,” the seats were quite comfortable, sufficiently padded, and came with a multi-position footrest. These premium economy seats offer six additional inches of pitch (over economy) with a comfortable recline for dozing. Overhead bins are more than ample for carryon luggage. Tip: The worst seats in the house had to be those in Row 30 of our cabin. Although they had plenty of legroom, passengers from the left side of the plane had to pass over the outstretched legs of these passengers to go to and from the lavatory on the right side of the plane. No small feat on a snowy day: Our flight left and arrived on time. Check-in at JFK was easy with a courteous and professional agent at the desk. The airline doesn’t have its own lounge at JFK but partners with British Airways, which operates the comfortable Galleries Lounge. 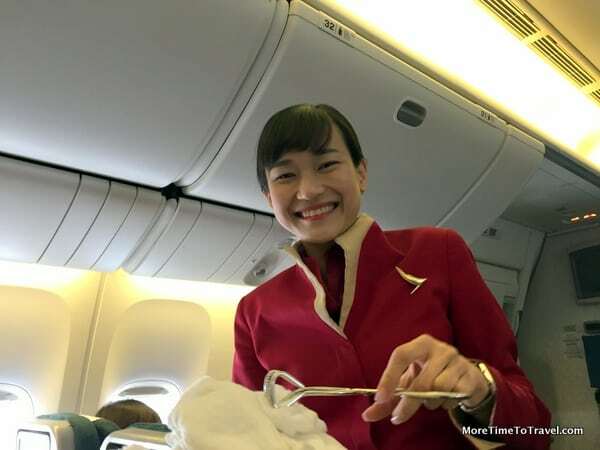 The bilingual Cathay Pacific flight crew was extremely gracious and efficient, far better trained and more hard-working than those we’ve encountered on many American and international carriers. They seemed happy, which is unusual given the state of the airline industry today. Service throughout our flight was flawless: Pillows, full-length blankets, and noise-cancelling headphones were on each seat when we boarded. In the seat pocket, was an eye-catching amenity kit, made of felt with illustrated black and white scenes of street life in Hong Kong; it contained eyeshades, earplugs and a toothbrush. There was one more round of complimentary beverages (alcoholic or soft drinks) with smoked almonds before we were served breakfast, a choice of an American breakfast or congee (a rice-based porridge that’s traditional in Asian breakfasts). Based on the “when in Rome theory,” I opted for the congee, which was delicious. It was flavored with ginger, green onions, and abalone, and served with fresh fruit and a croissant. Dinner was a duck stew that was adequate but nothing memorable, served with an appetizer of smoked salmon and potato salad. For dessert, flight attendants handed out small cups of creamy Haagen-Dazs ice cream. The state of the lavatories might well be the best measure of a carrier’s service. They were as clean and fragrant when we were close to arrival in Hong Kong as they were when we left New York. Most other airlines practice benign neglect. Each seat had its own inflight entertainment system with a choice of first-run movies, art house movies, Asian and Chinese cinema (with subtitles), and new releases. A nice countdown clock allowed us to keep track of the remaining time until our destination. The personal monitor had a handy USB port and also allowed passengers to stream movies from an iPod, iPhone or iPad. Given our experience, Cathay Pacific premium economy would be our go-to choice for any long-haul flight to Asia. The cost of premium economy fare is about 30 percent higher than economy but well worth it given the comfort, perks and service we received. For more information, including routes, see the Cathay Pacific website. On Holy Smithereens: Cathay Pacific London to Hong Kong in Business Class. What is it like to fly a Jet Blue Embraer 190? Wow, how nice, Irene! I’m admire your bravery taking such a long flight! When you first told me how long the flight was I didn’t think I could handle being on a plane that long. This looks comfortable and doable. I would definitely upgrade too. No way I could do Coach more than a few hours! Enjoy every minute of your adventure! Benadryl on the way back:)? Nice review. I’ll be flying PE from JFK to HKG in May and am excited to see if I have the same experience. I’m 6’1 so the biggest thing for me is the comfort of the seat and the ability to get at least 6 hours of sleep in! Nice little review here. I have flown Cathay pacific JFK-HKG number of times. I just want to point out that Premium economy cost up to 60% more than economy now which is sad news coz I love Cathay pacific premium economy. We’ve found that the cost of the premium economy upgrades vary by flight and season. Yes, 68% would be steep!